I love shrimp. I love that “jumbo shrimp” is a perfect oxymoron. My Grandma makes a mean shrimp scampi and I’ve had some other killer shrimp pasta dishes (Bar Tabac). Shrimp is delish on it’s own too. After getting the best burger, chocolate shake and fries in the world at Danny Meyer’s Shake Shack Friday night, Saturday night HAD to be lighter. oof. 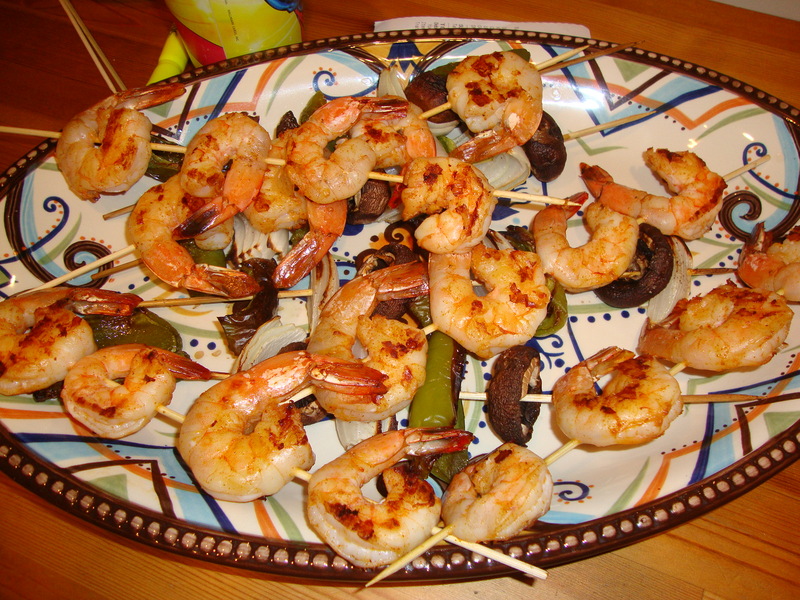 When we last visited our buddy Isaac in Orange, NJ he made delicious shrimp skewers so I took a page from his book. Being in a tiny Brooklyn kitchenette, of course, means no grill. Also, my Cuisinart grill only heats up now on one side (why?? goodbye paninis) so I have very limited grill space. I decided that I would cook the veggie skewers under the broiler on a cookie sheet. I used peppers, onion and mushrooms, with a little brushed olive oil and salt and pepper, but of course you can use anything. I think they came out really well. The shrimp was cooked on the Cuisinart a couple skewers at a time. Normally I would say shrimp is about 2 minutes on each side but mine definitely took longer and I had to flip them a couple times to make sure they cooked through all the way. This could be my fault but I have a feeling it’s more the Cuisinart’s fault. Of course, this looked like a lot of numbers to me so I ended up just eyeballing what I could. Heaven forbid I use my measuring spoons because then that is just one more thing I have to hand wash. sigh. I didn’t have any fresh lemon, but we actually ate the meal with some pineapple, which I think adds enough citrus taste. I also went light on the cayenne because the shrimp at Isaac’s was definitely spicy and I didn’t want to scare my Scottish&Irish hubs too much. I soaked my skewers ahead of time because I always imagine them bursting into flames. These were delicious and went well right before watching some Breaking Bad. Notice the beautiful platter my friends Erica and Tom gave us as a wedding present – thanks guys!